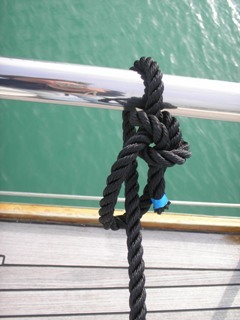 The Three Best Sailing Knots! 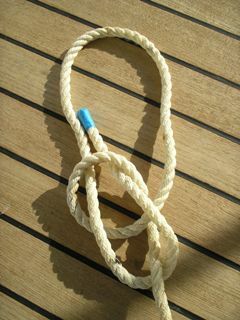 Sailing knots are a must for everyone who is involved in boating. You just can't go without them! In the year that I was 25 -26, I did 3 transatlantics in 1 year. A wonderful year! Now, as you can imagine, we had oceans of time onboard. It took us nearly 6 weeks to go from France to the United States of America or to the Caribbean. 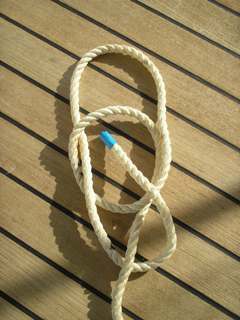 Anyway, in those watches where not too much is happening, we were busy practicing our nautical knots. 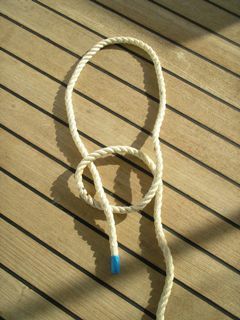 My buddy, Captain Larry, taught me 2 things about knots. First of all, there is no such thing as a 'slip knot'. A knot is a knot and a knot that slips, is not a knot! 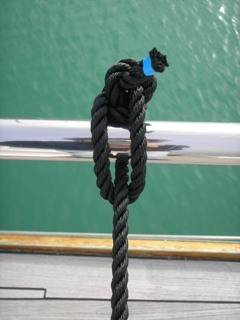 The property of a knot is that it holds the line, without that, it doesn't deserve the name 'knot'. Do you know what I mean? 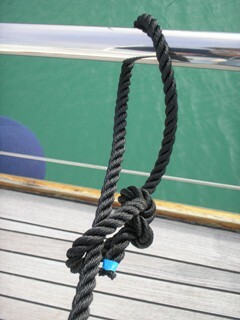 The second wisdom he solemnly said to me was: "In your sailing career you'll only need 3 sailing knots and that's it!'. 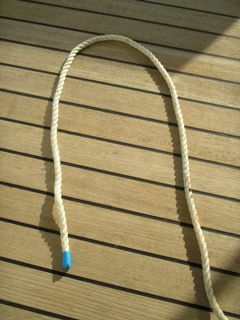 The bowline is one of the most versatile knots. It holds perfectly and you can always untie the knot, which is pretty important. In the pictures hereunder you see each step to make the bowline. I have marked the end of the rope with blue tape, this is your free bit of rope or your working end with which you make the knot. When you make the loop in step 2, imagine that the snake (the bit with the blue tape on) comes out of the pool (your loop), goes around the tree ( the standing part of the rope, which means the rest of the rope) and goes back in the pool. 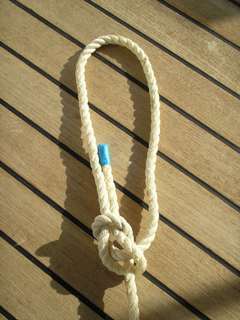 Now, what is also very interesting, is that you can make a bowline, not just around a certain object, but around the rope of the bowline itself. 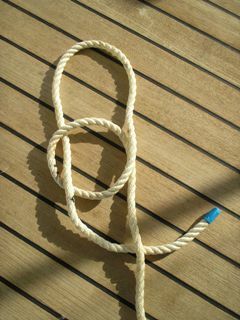 This way, the rope can become tight around an object. Have a look at the pictures to see what I mean. 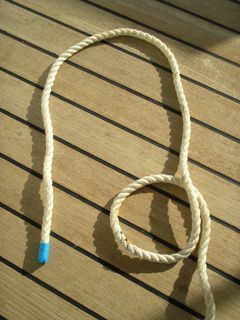 Here, the loop is made around the standing part of the rope, instead of a loop around the object. This way, you can tighten the rope around the object. 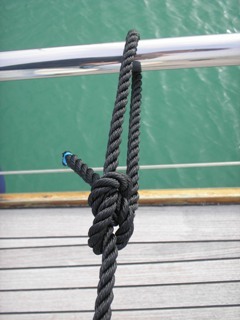 Go to the next page to see the other 2 most important sailing knots!